Hello! 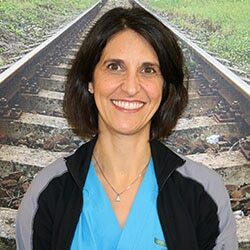 my name is Cathy and I have been working as a dental hygienist for over 20 years exclusively in an orthodontic office. The majority of my career, I have had the pleasure of working with my husband in his orthodontic practice in Oshawa until he retired. You will recognize me by my funky glasses in the clinical area where I will be ready to put your brackets on, adjust your wires and on the big day take your braces off!! I feel very fortunate to be a part of the team at Orthodontics at Don Mills and to work alongside Dr. Noble and Dr. Cassolato who are both very passionate in his attention to detail while taking great care in achieving the optimal alignment and occlusion for their patients’ teeth. When I am not in the office, you will find me on the courts playing competitive team squash, reading a good book, involved in a sewing project or on the slopes enjoying a day of skiing. I look forward to being a part of your journey through your orthodontic treatment.